De un solo uso. Los cassettes de flujo cruzado Sartorius™ Vivaflow™ 50 están listos para su uso para la filtración y la concentración de muestras de 100 ml a 5 l.
Optimally suited for applications like cell culture supernatant concentration, virus concentration and water concentration e.g. in fish breading facilities, this economical product offers a standard of ease of use, reliability and flexibility unrivalled by any laboratory filtration system in the market. The thin-channel, flip-flow recirculation path of the modules provides high crossflow velocities with minimum pump speed requirements. A single 50cm2 module typically reduces 500 ml to 15 ml in less than 50 min. Nearly total recovery of the concentrate is achieved with a single rinse. Up to six of the unique interlocking modules can be connected for easy scale up resulting in a capacity of several liters. Vivaflow 50 is intended for single use. 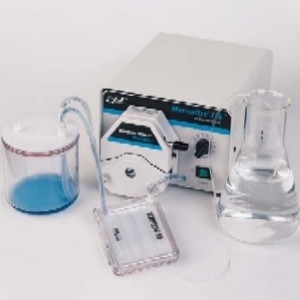 All accessories for sample concentration, except a peristaltic pump with a pump head for size 16 tubing, are included in the package. A 500 ml sealed diafiltration reservoir can be added to the system for rapid and convenient buffer exchange. The standard Vivaflow 50 package comes with two cassettes, tubing, flow restrictor, one series interconnector and high pressure pump tubing. All you need is a peristaltic pump with a pump head capable of handling 6.4mm OD tubing (size 16). For speeding up the concentration, as many as six Vivaflow 50 cassettes can easily be connected using 2 T-connectors for connecting 2 Vivaflow cassettes at the inlet and at the outlet and series interconnectors for connecting the devices in between. An optional pressure indicator (Fisher Cat# 14-558-332) may be used at the inlet for optimal control. A single 50cm2 module will typically reduce 500mL to less than 15ml in under 50 minutes. Less than 10mL minimum system recirculation for highest concentrations. Less than 1.5mL non recoverable hold up volume. Near total recoveries achievable with a single 10mL rinse.